"PICTURE a fight which people clash head-on, making no attempt to block the opponent. Clearly the man with the longer reach will be the first to get in his punch, while the one with greater power only has to throw in his body weight to win. Too many karate methods are like this- reckless, giving no thought to defense. In the days where karate was first devised it might have been acceptable to meet head-on and start punching away, but times change and we can no longer afford to do that. Ashihara Karate was created out of the need for a more practical system of Karate that takes into account the realities of today's world. 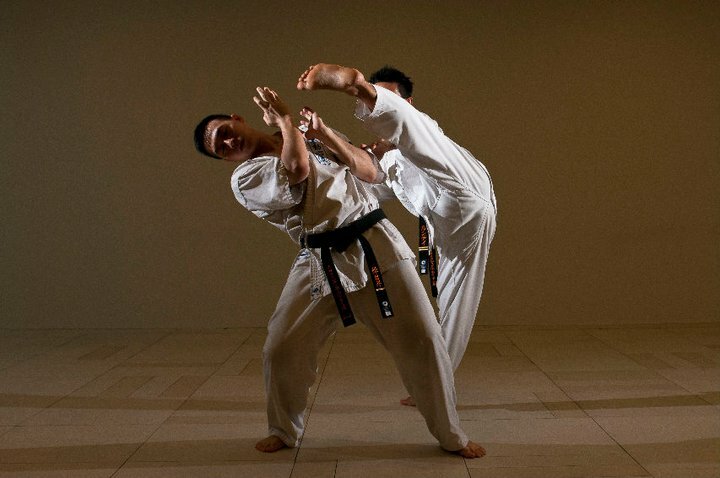 It is an eclectic Japanese martial art that focuses on real fighting applications or jissen (実践), while being an excellent means of cultivating the human body, mind and spirit. 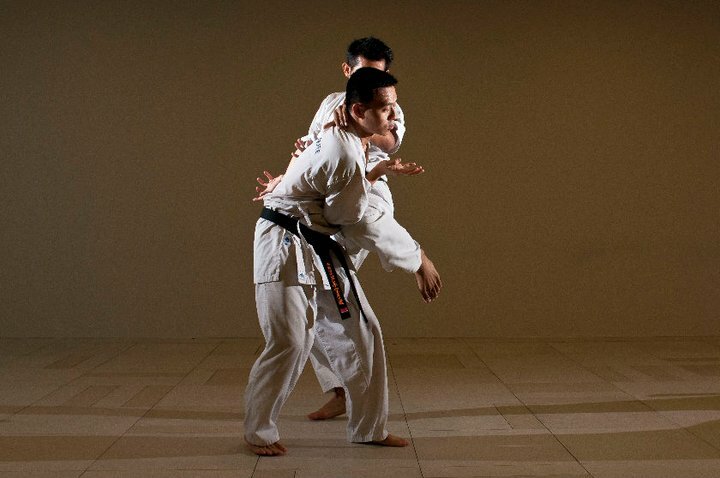 In comparison to the traditional karate approach, Ashihara Karate training emphasizes natural body movements and straightforward techniques that are directly applicable from practice, over relying on brute strength and complex forms. For fighting and self-defence, the System emphasizes on the concept of sabaki. In Japanese martial arts, sabaki commonly translates to 'positioning' or 'angling' the body, with reference to the opponent. (e.g. the "blind spot"), and ultimately establishing control over him. This is what makes Ashihara Karate an effective form of self-defence as it enables anyone, with the correct effort, be able to overcome an opponent regardless of his size or physical prowess. Sabaki involves the use of controlling techniques (e.g. breaking balance, positioning, deflection, etc.) to tactically move away from the line of attack and into a good position, where the opponent can be much easily managed. To do this, circular movements are often employed- moving forwards or backwards diagonally to either side. 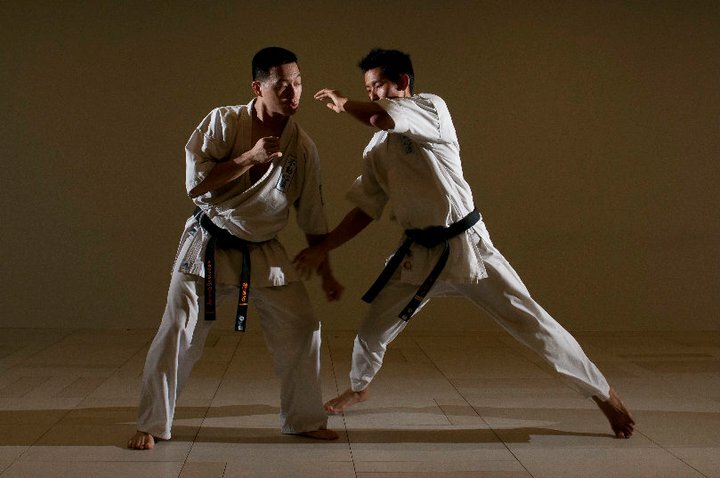 ​Thereon, a counter-action, a punch, kick or throw can be delivered with minimum resistance from the opponent. "Circular movements means that, rather than meeting an opponent head-on, you should try to circle and move around him, pull him forward, turn him.. 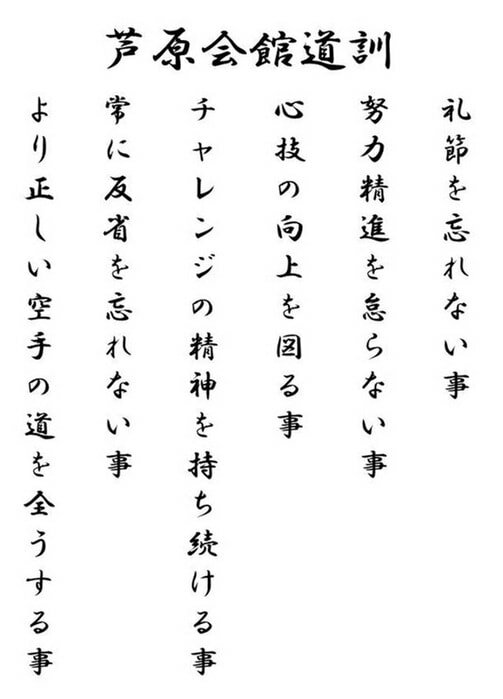 In other words, always try to stay at his side or back, those positions being the most difficult for him to attack. If you can get into a safe position from which your victory is assured, there is no need to continue to inflict pain. However, unless your opponent realizes that he has been bested, he may resist forcefully, then you will have to knock him down. He will also have to realize that, having now been controlled, any further attack to him in that position will cause him massive injury." Right: The 4 Motions, referring to the diagonal directions in which Ashihara Karate movements are based upon, is represented in the official logo of New International Karate Org. (NIKO), the world governing body of Ashihara Karate. The pleasure in Ashihara Karate study lies in the philosophy of enjoying karate practice and creating an environment of mutual improvement. Practitioners regardless of age, gender and physical ability strive to embody the "sabaki spirit", where the weak and strong help each other advance step-by-step. In our classes, Ashihara Karate is practiced as a martial art, rather than for sports competition or artistic appreciation. As such, our practice is aimed at cultivating effective self-defence skills and continued personal development. Training therefore involves drills, techniques and discussions based on these goals, with no definite rules of engagement other than upholding a culture of safety and good spirits. Note: Participants interested in competition Karate are placed in a separate program, designed specifically to take into account the rules and regulations of the sport.